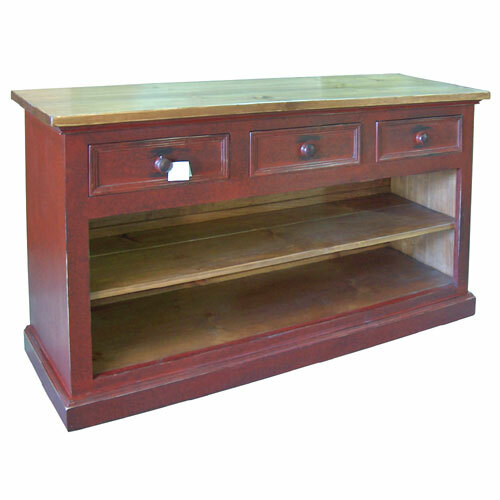 This French Country, solid-wood wine buffet is a functional piece of furniture for your dining or kitchen area. 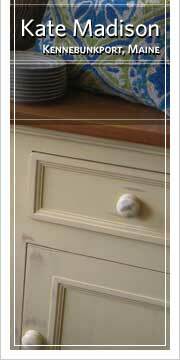 The three bevel drawers provide lots of room for storing silverware and table linens. Below, is an open shelving area, perfect for cookbooks, dishes, or diosplay storage. This solidly constructed piece has custom-joinery, generous moulding, and paneled doors. Made of 100% solid pine wood. The top and inside are finished natural. The outside is finished in the highest-quality milk paint to give the item a distressed, antiqued appearance. Natural stain is our standard stain finish and is already selected, if you would like to select a different stain do so above. Select "Painted Top" if you want the top painted. Need To Customize The Size? We can customize this item to fit your specifications. TELL US what you are looking for. Top Options We offer (5) styles of tops on all of our sideboards: Stained Pine, Aged Finish, Hand Planed, Birch, and Vintage Pine. Click on any table top example below and see images of that top style. "Stained Pine" is our standard top and can be finished in any of our stains or milk-paint finishes "Aged Finish" is a new pine top finished with multiple coats of stain which build up the finish to a Mahogany color. We then distress it with tools to give it some character. This is an alternate to our Vintage Pine. "Hand Planed" is a Stained Pine top where we plane down the surface to open the grain of the wood which allows a deeper stain color. This technique provides an uneven, grooved surface for a more rustic look. "Vintage Pine" is made from reclaimed wood from old hunting cabins, buildings, and cottages. No two tops are alike, some are more rustic than others, they can be very distressed by their weather worn age. You should expect that some have divots and worming. "Birch" is a hardwood top that has a less grain and no knots when compared to Pine. Birch is a popular choice for customers looking for a harder top for children or heavy wear.